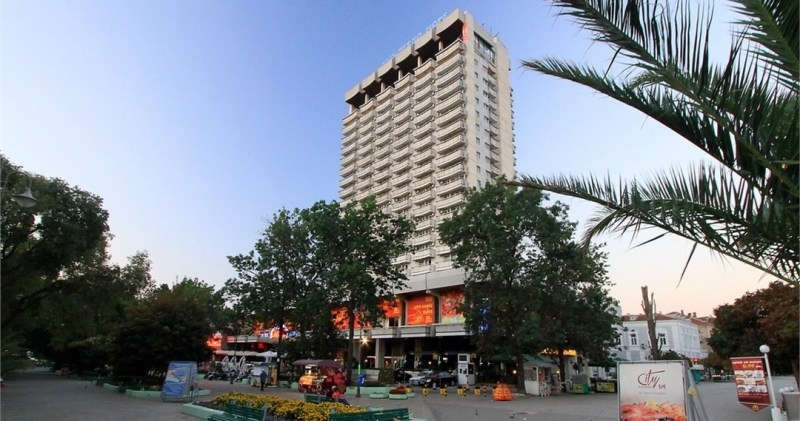 Location: The hotel is located in the heart of Varna (just in the business and cultural center of Bulgarian Sea Capital, right on the main trade street), close to the Sea Garden, at 100 meters from the beach. Accommodation: The hotel offers 60 renovated rooms with A/C. The room facilities consist of: cable TV, radio, telephone, refrigerator, private bathroom and WC, bathtub or shower, balcony. Food: Main restaurant, Panorama restaurant, summer terrace, lobby-bar, sky-bar, Vienna café, English pub-club with live jazz music, folk-restaurant (which turns into disco after midnight), Bulgarian national restaurant /with ancient atmosphere/, with BBQ on coals. Sports and facilities: Fitness centre, solarium, massage. Other services: Conference hall, casino, night club, laundry, currency exchange, beauty shop, parking.